BMW Ireland says it has a range of deposit contribution offers designed to help customers find their perfect BMW. The offer is extended to 1 and 3 Series models as well as the X1 and will run from July 1 to December 31. The BMW 1 Series model receives updates to the model range in July 2017, including a redesigned interior, latest generation SatNav, ‘Servotronic’ steering, and many new colours. BMW says that it is offering contributions ranging from €2,500 (including VAT ) on SE and Sport models, while M Sport models receive a €4,000 (including VAT ) contribution or €325 per month for a 118i SE five-door with BMW select finance. Finance packages are available on the 1 Series and feature an APR of 4.9 per cent with BMW select finance. From July, 2017, all new BMW 3 Series Saloon and Touring models will receive the same enhanced standard equipment as the 1 Series. This includes Servotronic steering, LED headlights and fog lights, the latest generation software for the BMW Navigation system, and models fitted with ‘Professional Navigation’ will feature the larger 8.8-inch display Touch functionality. For the 172 period, BMW Ireland says that it is offering deposit contributions of €3,500 (including VAT ) on SE and Sport models and €5,000 (including VAT ) on M Sport models. Prices for the 3 Series start at €39,630 OTR for the 318i SE. Finance packages are available on the 3 Series and feature an APR of 4.9 per cent with BMW select finance. 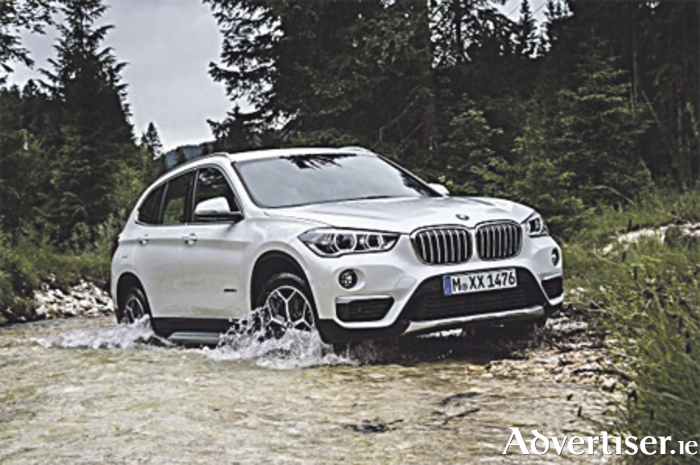 The BMW X1 will feature an offering of €2,000 (including VAT ) and an APR of 5.9 per cent with BMW select finance. BMW says that topping the 1 Series trim levels is a new ‘Shadow Edition’. This model features all the specification from the popular ‘M Sport Plus’ package - M Sport braking system, Harman Kardon loudspeakers, and sun protection glass. Additional standard equipment includes cruise control, rear park distance control and extended lighting, along with a wide array of unique additional features. These include black kidney grilles, dark chrome tailpipe, 18-inch M light alloy wheels in jet black or bi-colour, darkened LED headlights, and smoked rear lights. Like the 1 Series model, the new 3 Series is also introduced with a Shadow Edition. Adding a plethora of features to the existing M Sport specification, Shadow Edition models combine the elements of the M Sport Plus package. These include M Sport braking, sun protection glass, a Harman Kardon loudspeaker system, high-beam assist and full black panel display, plus unique features such as darkened LED headlights, smoked rear lights, black kidney grilles, black mirror caps, dark chrome tailpipes and exclusive 19-inch M light alloy wheels in Orbit Grey Bi-Colour. Prices for the 3 Series Shadow Edition start at €43,530 OTR or €379 per month for a BMW 320i Shadow Edition.